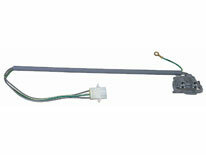 Lid switch replacement used on some Whirlpool, Crosley, Estate, Inglis, KitchenAid and Roper brand washing machine models. 394924, AP3100003, 3949237, 3949239, 3949240, 547225, AH350434, EA350434, PS350434. The lid switch was created to secure the lid closed before enabling the machine to spin or agitate.